InCloud360 provides consulting, implementation and support (post implementation) services for the cloud based business applications (services) we resell with Intacct Cloud ERP best-in-class accounting and financial management software being our core offering. Our industry knowledge and direct experience in practitioner roles serves us well in providing advisory and consulting services for operational improvement – specifically in terms of process improvement, automation and best practices. 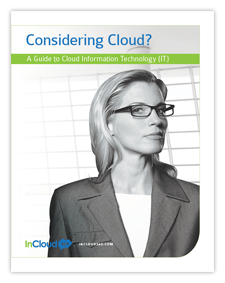 Having lived with the outcomes of our recommendations is a differentiator for InCloud360. Our recommendations focus on the cross functional core business processes having the greatest opportunity for improved efficiency – such as the Quote-to-Cash process. At InCloud360, we have experience implementing large scale enterprise ERP and custom development projects therefore we generally follow the traditional waterfall methodology for project delivery. However, SaaS solutions, or cloud services, allows us to adopt a more agile methodology – especially the smaller less complicated projects or projects that have some degree of uncertainty. This approach requires a larger degree of commitment of engagement and active collaboration from the client, which when adhered to allows InCloud360 to provide shorter project timelines and the potential for a lower implementation cost. Cloud services implementations require substantially less on-site actively because much of the configuration work is done within the service providers console by the implementation team. For other activities that are consultative in nature such as process improvement, we prefer to work very collaboratively with our customers – generally on-site or via web conferencing. The consulting component of the project, local service and support, and the level of experience beyond the core application is the differentiation between VARs and the service providers. Some activities can be delivered by the customer in order to lessen the implementation cost. We are flexible and therefore work with our customers to find a schedule and approach that meets their needs and budget.